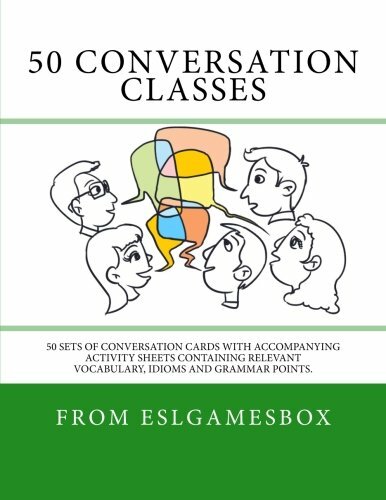 Get your students talking with these themed conversation classes consisting of a set of conversation cards and an activity sheet containing relevant vocabulary, idioms and grammar points. The basis of a good conversation class is giving learners a reason and an opportunity to speak and scaffolding that speaking with lexis and grammatical structure as it is needed. The most fruitful conversations arise spontaneously and there is an art to listening well and asking the right questions to in order to uncover the nuggets of universal interest which provoke stimulating classroom discussion. However, some days we come up empty handed, maybe our learners are tired or reluctant to publicly speak up. Here it is also the teacher’s role to give learners a gentle push into areas which hopefully will create intellectual arousal and thus opportunities for the teacher to support this output with appropriate input. The activities in this book are intended to facilitate and support rich and stimulating conversation and are not designed to produce standardised lessons. Each unit contains many possible branching off points which can be either pursued in more depth or accepted at face value.